This post is not about an identity/language crisis. It’s about milk. I heard somewhere that it’s not so good to drink a lot of milk when you are an adult and that it’s better to drink soymilk. I drink a lot of skim milk – at least half a liter a day. I buy it by the gallon, sometime two at a time, and I always finish it before it goes bad. So I thought about trying soymilk as a substitute. I bought a bunch of different brands/types in order to try them and I’m still going through them. But I can’t many compelling reasons why I should drink soymilk instead of milk: They have about the same calories but soymilk has more fat. They have about the same amount of calcium and proteins. The internet has not been very helpful, too much conflicting information. 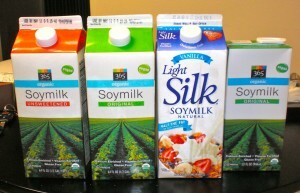 Soymilk lasts for months, that’s big in my book. I can just stock up on cereal and soymilk and never go to supermarket. Also, apparently soymilk is better on the environment due to all the methane that cows produce and the energy it takes to raise them, and so forth. I’m not going to become a tree-hugging vegan health freak… yet. But if you know more on this subject, I’d love to hear it. ” Soy naturally contains isoflavones, plant chemicals that help lower LDL (“bad” cholesterol) if taken as part of a “heart healthy” eating plan.” And, I like Silk Light for soymilk with even less fat content. I use Vanilla Silk Light w/ cereal…love it, and it does last a lot longer, so I don’t end up throwing out old milk. Also, the Chocolate Silk is delish for a protein-packed snack substitution and to take care of a mid-afternoon sweet tooth. I don’t have much info on the benefits relating to organics, but it seems like it’s pretty much personal preference. I say, go with your preference. Like Rebecca, I’m a fan of soy milk. I normally buy the refrigerated kind and go for the plain light variety — usually the store brand or Silk if it’s in stock. I think the soy milk is rich in flavor and feels like a treat even though it’s healthy and low in fat. Adam drinks skim milk and I don’t have a problem with it — it just tastes thin and not as special occasion-ey.